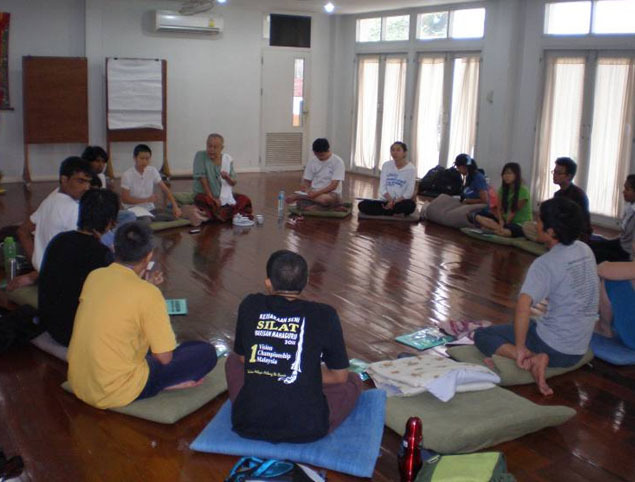 INEB has organized a Socially Engaged Buddhist (SEB) Course for its youth internship program. These courses are concerned with young leadership; to more understand deeply about Socially Engaged Buddhist in order to bring Dharma back to society with emphasis on meditation, peace and reconciliation, ecology, women issues and empowerment, community building, alternative development, and more. The Socially Engaged Buddhist (SEB) Training Course is part of INEB?s youth program. It was initiated and organized by an alumni group of the International Youth Exchange Program for Peace and Social Innovation started in 2010, with the aim of empowering young people to awaken their capacity, foster relationship among networks, and support deeper understanding about Engaged Buddhism within individual, social and environment aspects.The program of training course attempts are promote understanding of the Engaged Buddhist by introducing the concept and practice of Engaged Buddhism; Buddhist perspectives on society, economics, education, and ecology; Meditation practice and personal development; and the role of socially engaged activists. The training course was designed to inspire and broaden the knowledge and understanding of young leaders to bring about transformation, which integrates spirituality and social action based on the universal truth of wisdom and compassion. There were nineteen participants from INEB?s network who joined SEB Training Course 2011. They represented Deer Park Institute (India), Khmer Youth Association (Cambodia), Dharmajala (Indonesia), Spirit in Education Movement (Thailand), Buddhist Youth Empowerment Program (Myanmar) and Buddhist Missionary Society (Malaysia). It was organized as a five day training course including field trips to Engaged Buddhist leaders, alternative communities and social enterprises. It took place from 24 July to 31 July 2011 in Thailand. The training course approach utilized participatory and experiential learning. The collaboration and cooperation between participants and facilitators during the training course was beautiful, and enriched the knowledge of each other. Embracing diversity was possible and meaningful through celebration and ceremony such as sharing prayer of each religions from different countries, culture night party with traditional cuisine and dance, sharing meditation and yoga practice, and sharing about each organization. The core team of SEB Training Course 2011 consisted of 6 people. They are Pappu (DPI-India), Trilock (DPI-India), Vian (Dharmajala-Indonesia), Phat (INEB-Thailand), Melva (Dharmajala-Indonesia), Rudy (Dharmajala-Indonesia), and many supporters behind of scene. Each member of the core team was an alumni of INEB?s youth exchange programme, meaning that this SEB course was truly participatory in its design, created from the learning outcomes of the youth exchange, and expanded beyond to new participants who will be taking part in the coming years? exchange. The core team also acted as facilitators for the course, along with the participants who were also given their own role and responsibility. This approach was in the spirit of engagement, which offered practice, support and service together as one community. Usually at the end of the day, the core team could share feelings and evaluate the weaknesses during the facilitation and management based on non-violent communication. This reflection meeting was vital to deal with misunderstandings about roles and personal tendencies, maintain solidarity and self-respect.